ANTONOV Company will take part in AFED−2018 within a period from February 25 to March 3, 2018 to be held in Riyadh, Kingdom of Saudi Arabia. During the exhibition, meeting and negotiations concerning further interaction with partners from Kingdom of Saudi Arabia on the programme of the AN−132 multipurpose light transport, development and initiation of new joint projects are planned. Program of the new AN-132 multipurpose aircraft creation is the joint project of Ukraine and Kingdom of Saudi Arabia. It has to become an important element of “Saudi Arabia’s Vision 2030”, which includes main reforms in the Kingdom’s economy to reduce its dependence on oil. Development of aviation segment takes a proper place in the program. This goal has to be reached by state’s investments and cooperation with foreign enterprises of the global aircraft industry. These principles are used in fulfillment of the AN-132 project. Participation in this aircraft creation will provide Saudi Arabia with possibility to cognize vast experience of Ukrainian specialists in segment of the transport airplanes development, as well as to receive the modern aircraft able to perform various tasks. The key partners on the AN-132 program are ANTONOV Company, King Abdulaziz City for Science and Techniology (KACST) and Taqnia Aeronautics Company. Leading suppliers of the global aircraft industry are involved in the project. The AN-132 project was launched in April 2015. Following demands of Saudi partners and analysis of the world market of multipurpose aircraft, the world-known AN-32 transport was selected as the basis for the new airplane. The AN-32 is called as “Silver Horse” in India because of its ability to take off and land at the alpine (up to 4500 m) airfields. The new aircraft inherits the best features of its predecessor: possibility to be operated under hot climate and high mountain conditions due to high power availability, take off and land from/to all types of airfields, reliability and flexibility in operation. The AN-132 differs from the AN-32 with a new level of technical, economic and flight performance data: lifting capacity is increased by 23%, flight range is 1.72 times more while carrying 6 t of cargo, higher fuel efficiency, lower noise and emission level. The new aircraft is intended for various tasks including anroute transportation of material, mail and other cargoes “in bulk” or using aviation pallets as well as transportation of light selfpropelled and nonself-propelled vehicles weighting up to 9.2 t.
AN-132 will be capable of around the clock allweather operation and at any latitudes. A number of the AN-132’s advantages are provided by using of the most modern aggregates, systems and vendor items. 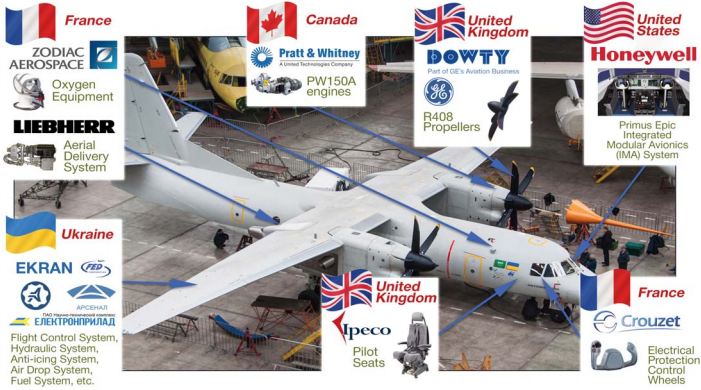 In particular, Pratt & Whitney Canada PW150 engines equipped with sixblade R408 of British Dowty Propellers provide exceptional payload capacity, fuel efficiency, excellent climb and cruise performance while generating low noise levels and lowcost maintenance. Owing to implementation of the modern Primus®Epic avionics complex of Honeywell AN-132 has “glass” cockpit. The aircraft control and all the transport tasks, including aerial delivery, to be performed by two-member crew. radio communication within 8.33 kHz channel spacing and within HF range. In November 2017, PPG, one of the biggest US companies, the world-known supplier of high-quality glass for aircraft construction, signed MoU on participation in the AN-132 program. Karl Berger, General Manager of PPG Aerospace, said that their company will be glad to take part in the international program AN-132 and cooperate with the key partners – ANTONOV Company, KACST and Taqnia Aeronautics. AN-132D demonstrator, the first prototype of the AN-132, performed its maiden flight on March 31st, 2017. The aircraft was controlled by mixed crew of ANTONOV and the Taqnia Aeronautics Company. AN-132D was escorted by a new AN-178 jet transport. Since that day, AN-132D performed about 70 test flight with total duration of about 110 h. In particular, behavior of the aircraft at high angles of attack was tested. Wind tunnel tests are in progress. Due to capabilities of onboard loading complex AN-132 can perform autonomous cargo loading/unloading while additional ground handling equipment is not required. Recently, AN-132D successfully passed ground tests of the personnel embarkation, self-propelled vehicles loading/unloading and accommodation of injured persons on the stretchers. From the onset, the AN-132 was intended to be a basic platform for the design of a number of modifications of civil and military aircraft. Emergency management mission include evacuation of civilian population from disaster areas, casualties at standard stretchers and airdropping of paratroop rescue teams. 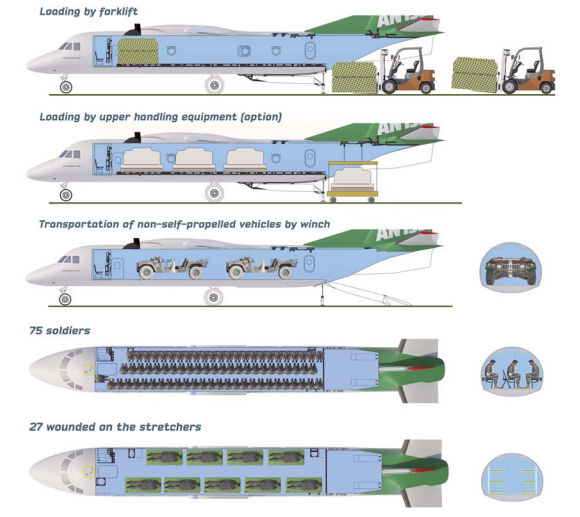 Future military transport will carry and airdrop personnel, paratroopers, light wea-ponry and military equipment, vehicles and cargoes. 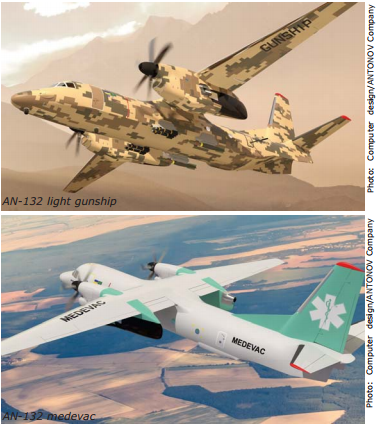 Fire extinguishing aircraft, search and rescue aircraft, intelligence surveillance &reconnaissance, maritime patrol, jammer, medical aircraft, light gunship airplane, other specialpurpose variants can be developed on Customers’ demands. The operators of the aircraft will receive reliable after-sale support, with specialists from the Informational Center for Customer Support providing Customer Representatives with around the clock (24/7/365) information and technical support for customer aircraft operations. The AN-132 requires flight personnel training using a D level simulator, allowing simulation of all the situations of a real flight. The training center previously called as ANTONOV Academy for technicians, engineers and workers to be engaged in the AN-132 construction at the plant in the KSA will AN-132 light gunship AN-132 medevac be established. Partners on the program expect that the aircraft will compete with other such aircraft on a global scale. In particular, the AN-132 may replace some of the light transports including the AN-32, AN-26, G-222 and C-235, operating in different regions of the world. The AN-132’s unique advantage is its high thrust-to-weight ratio, which provides efficiency in hot climates and alpine terrains. Another advantage is the aircraft’s ability to fly with one inoperative engine at altitudes over 4,000 m, considerably exceeding the capabilities of C-295 and C-27J in most cases. The flight safety in mountain terrains is much improved as a result. Wide track of the AN-132’s landing gear provides a higher aircraft stability while operating on unpaved airfields. The AN-132 is optimal in its transport niche, and will have a significant place among the world renow-ned ANTONOV fleet.